You can download SAdr BETA 0.6 32 bit (Windows XP/SP3, Vista or 7) here (SetupSAdr_0_6.exe 183,397 bytes 2012-02-12). SAdr was written in VB.Net and compiled for the .Net framework 2.0 (part of Windows since WinXP SP2). A new version with additional functions will be available before June 2013. Some of the new functions are: find duplicate entries, read CSV-files, duplicate entry (useful for family members). Why yet another address management application? There are dozens of address management systems, some of them even free and still with more functionality than SAdr. 1) Ok, the .mdb format is not as open as e.g. xml but it's not likely that MS Access will disapear in the next years. The application is intended for private use and best suited for people familiar with Microsoft® Access. Access was chosen as preferred format because it's so trivial to work with. This is a BETA version! There is absolutely no warranty at all, that this program will run as intended. The UID tag is ignored. Importing the very same vCard twice results in a duplicate entry in Androids contact list. The CATEGORIES tag is ignored so that group membership is lost. The HOME address is completely ignored (this bug is present in Thunderbird for many years). The photo is ignored as well as messenger and group (categories). As before UID, CATEGORIES and PHOTO are ignored. There is no field for messenger. During the import to SAdr, a field comparison and check is possible providing this way a "sync" function. (Maybe I'll write an Android App as well, to provide a true synchronize function. At the first start you must select a database. The default location for the SampleAdr.mdb is "My documents". 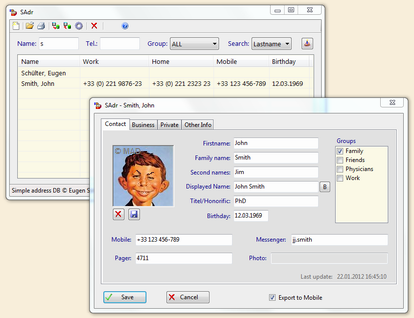 To zoom phone numbers from a contact, right-click on the contact list in the main window; to edit double-click.